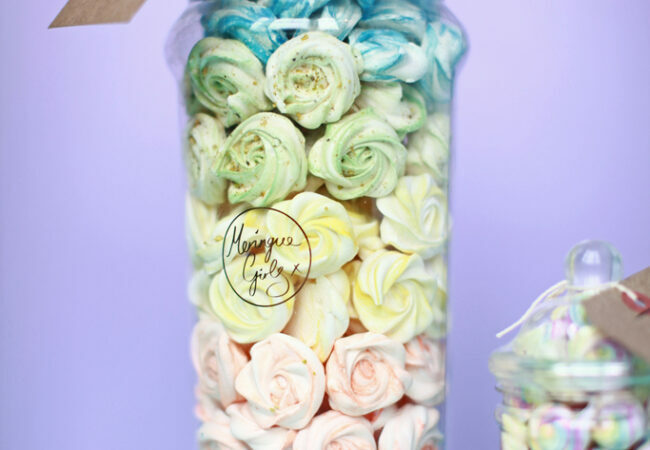 GIANT rainbow jar filled with approximately 100 rainbow roses in 5 of our favourite flavours. Perfect for a birthday surprise, to decorate a cake, in the centre of a wedding table, or just because. The jar is around 34cm high x 13cm wide, filled with meringue roses approx 3cm x 3cm. Pink – freeze-dried raspberry, Orange – passionfruit essence, Yellow – lemon essence and citric acid, Green – rose essence and chopped pistachios, Blue – juniper essence.